The Spanish for Groups Program is designed in conjunction with the people in charge of the group, according to the group’s learning and/or cultural needs. 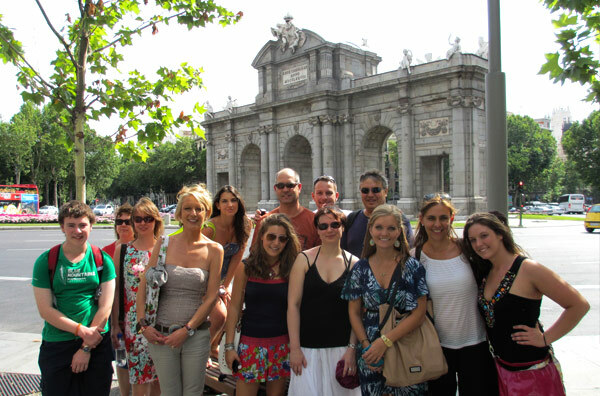 These are tailor-made programs designed to make your stay in Madrid an enlightening and unforgettable experience. See here testimonials of the many groups from all countries that have visited us since 2008! The Spanish course runs from Monday to Friday, from 9:00 to 12:15 (with a break from 10:30 to 10:45), in closed groups or together with other pupils in the school. If the client wishes, the classes can be designed to focus on specific tasks as well as to cover subjects relevant to the students’ learning needs, such as the media, the environment, young people in Spain, etc. The cultural program is designed to promote the continuous use of the language. Therefore, it includes a daily activity from Monday to Thursday and an optional excursion to a place of historical-artistic interest outside Madrid on Saturdays.